Ingredients: Beef, dried cranberries, dried blueberries, sea salt, coconut sugar, spices, celery powder, garlic, natural extractives of spice, cherry powder. Review: The first flavors that hit my tongue are a light sweetness, a touch of salt, and little bit of meaty, fatty flavor. The chewing brings on a mild sausage flavor comparable to summer sausage, but with light black pepper and touches of garlic. Every so often, my teeth bite into the fruit and gives me the texture of something soft and mushy, unlike the sausage-ish texture of the meat. But I don't get any burst of tart, berry flavor, which is what my expectation was. What I get is a touch of fruity-character mixed throughout the meat. Otherwise, this largely tastes like a black-peppery summer sausage, a little more sweet, and slightly fruity. 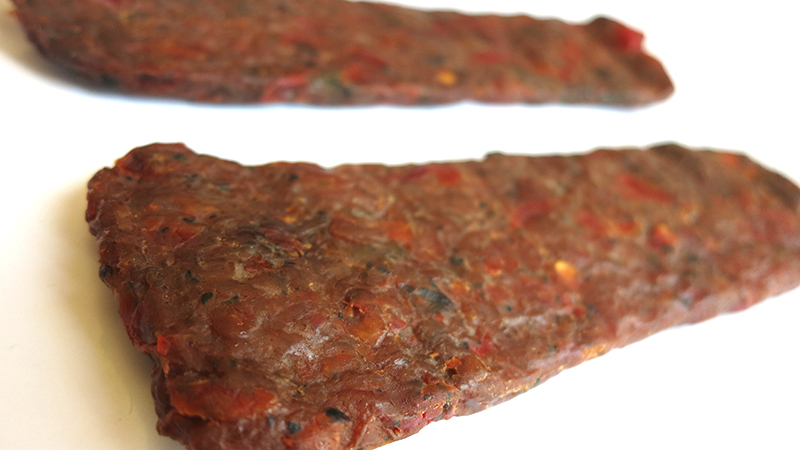 The chewing texture initially has a rubbery feel, and once chewed down soft tends to feel like stiff sausage. I didn't find anything stringy, nor anything unchewable. It feels very meaty, aside from the bits of soft fruit. Ingredents: Venison, dried apples, apple butter, beef, sea salt, coconut sugar, spices, celery powder, garlic, natural extractives of spice, cherry powder. Review: The first flavors that I pick up are a meaty, fatty flavor with a touch of salt. The chewing brings on much of the same, with a bit of spiciness. Considering this is a blend of venison and beef, I still do taste the unique flavor of venison, but not the expected "gamey" flavor. Overall, it's a mild natural meat flavor boosted with some kind of spiciness. It's not hot at all, but those with very delicate tongues could perceive this as spicy. I don't taste any apple in this, though the apple butter is lightly noticeable. Otherwise, this doesn't give off any noticeable or defined fruity character, despite my being able to see plenty of apple chunks. There's a very light sweetness in the background. The chewing texture is more soft than the Dried Beef I reviewed above. It's not quite as rubbery, and perhaps more pleasant to chew. It still chews comparable to summer sausage. Ingredients: Chicken breast meat, dried mangoes, sea salt, coconut sugar, spices, celery powder, garlic, natural extractives of spice, cherry powder, gluten free soy sauce, organic pineapple juice, organic apple cider vinegar, purified water, sesame oil, garlic powder, ginger powder. Review: The first thing I taste from these snacks is a light soy sauce and sesame oil. The chewing brings on the flavor of chicken, along with a noticeable sweetness, and some black pepper. I can later identify a touch of garlic. Despite being made with dried mangoes, and being able to see chunks of the fruit mixed into these sticks, I don't taste any of it. I don't even get a fruity flavor, or bursts of anything sweet. I think the soy sauce, sesame oil, and black pepper are dominant enough that they tend to overshadow the mango. Otherwise, this chicken variety is actually quite good. I really like how the chicken flavor really comes through, along with the soy sauce and sesame oil. The black pepper makes this rather spicy, so if you have a sensitive tongue, be aware. The chewing is quite good for a chopped and formed meat snack, giving off a meaty chew that retains the chicken breast chewing texture, but in a meat-stick form factor. I can still feel the chicken breast meat fibers, just like eating real chicken, but packaged up in a soft yet chewy, seasoned, marinated stick. Ingredients: Chicken breast meat, dried red bell peppers, flaked black beans, dried tomatoes, sea salt, coconut sugar, red pepper, dried jalapenos, spices, celery powder, garlic, natural extractives of spice, cherry powder. 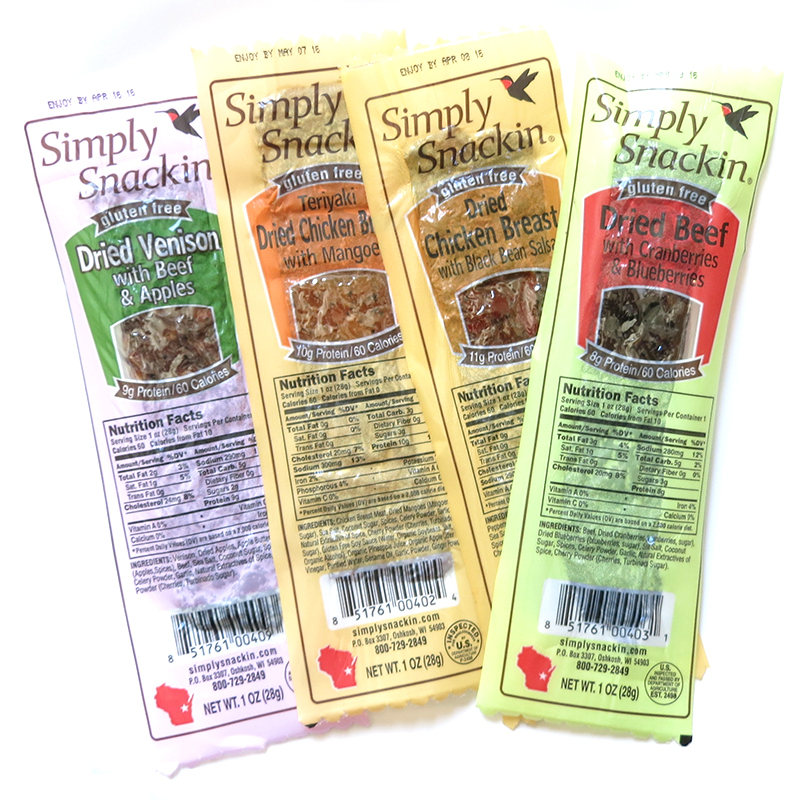 Review: The first tastes that touches my tongue are the jalapeno flavor, dried tomatoes, and dried red bell peppers. The chewing brings on more of those flavors, but also lets in a touch of garlic, and some of the black beans. This is actually, very good! I don't pick up much of the chicken breast flavor, but it still has the soft, meaty, chicken breast chewing as its Mango cousin I reviewed above. But otherwise, this is bursting with spicy flavors of the southwest, namely the jalapeno and red bell pepper. This almost reminds me of eating spicy chicken fajitas with some salsa and refried beans mixed in. This generates a fair amount of heat too. On my personal heat scale, I rate this as "medium" (level 3 out of 5). The chewing texture is a little more soft than the Dried Chicken Breast with Mangoes, and perhaps because of the black bean ingredients, tends to feel more mushy. But yet, it still offers the meaty, chicken breast feel. 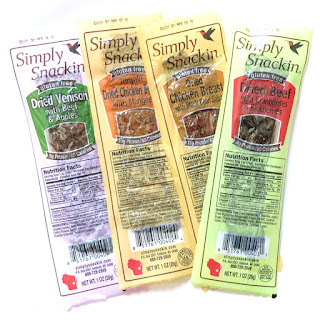 Simply Snackin seems to be ideally suited for fitness enthusiasts for its high protein, low sodium, and all natural ingredients. It's even gluten-free too. I think their chicken varieties are the best because the overall flavors are tastier, and they chew more like real meat. The fruit varieties I reviewed, however, don't really represent their fruit flavors well. Perhaps my expectations were too high, but I envisioned bursts of tart, fruity flavors against seasoned meats, and what I got was largely the seasoned meat. The Dried Chicken Breast with Black Bean Salsa was the exception, but is quite intense with flavor and is something you'll want to drink down with cold water.